TORONTO, ONTARIO--(Marketwired - Dec. 1, 2016) - Probe Metals Inc. (TSX VENTURE:PRB) ("Probe" or the "Company") is pleased to announce that it has entered into a binding option agreement with Alexandria Minerals Corporation ("Alexandria"), whereby Probe may earn up to a 70% interest in the Cadillac Break East Property (the "Property"), located 25 km east-southeast of Val-d'Or, Québec. 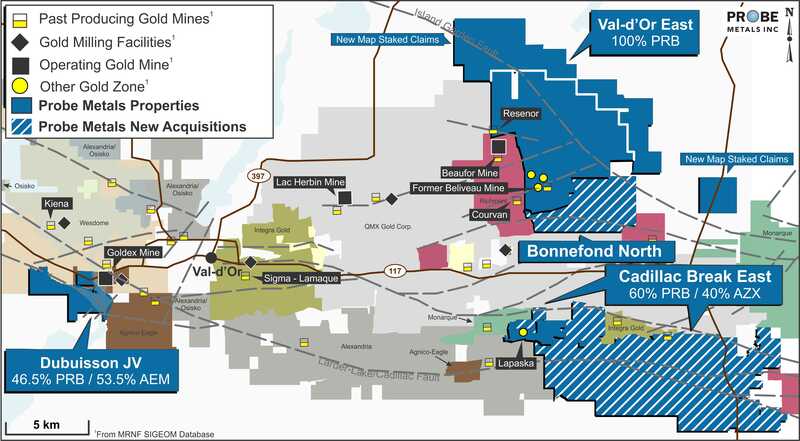 The Property is comprised of 232 mining claims totaling approximately 72 square kilometres and will be part of the Company's Val-d'Or East Project ("Val-d'Or East"). Please visit our website at www.probemetals.com. Neither TSX Venture Exchange nor its Regulation Services Provider (as that term is defined in the policies of the TSX Venture Exchange) accepts responsibility for the adequacy or accuracy of this release. This News Release includes certain "forward-looking statements" which are not comprised of historical facts. Forward-looking statements include estimates and statements that describe the Company's future plans, objectives or goals, including words to the effect that the Company or management expects a stated condition or result to occur. Forward-looking statements may be identified by such terms as "believes", "anticipates", "expects", "estimates", "may", "could", "would", "will", or "plan". Since forward-looking statements are based on assumptions and address future events and conditions, by their very nature they involve inherent risks and uncertainties. Although these statements are based on information currently available to the Company, the Company provides no assurance that actual results will meet management's expectations. Risks, uncertainties and other factors involved with forward-looking information could cause actual events, results, performance, prospects and opportunities to differ materially from those expressed or implied by such forward-looking information. Forward looking information in this news release includes, but is not limited to, the Company's objectives, goals or future plans, statements, exploration results, potential mineralization, the estimation of mineral resources, exploration and mine development plans, timing of the commencement of operations and estimates of market conditions. Factors that could cause actual results to differ materially from such forward-looking information include, but are not limited to failure to identify mineral resources, failure to convert estimated mineral resources to reserves, the inability to complete a feasibility study which recommends a production decision, the preliminary nature of metallurgical test results, delays in obtaining or failures to obtain required governmental, environmental or other project approvals, political risks, inability to fulfill the duty to accommodate First Nations and other indigenous peoples, uncertainties relating to the availability and costs of financing needed in the future, changes in equity markets, inflation, changes in exchange rates, fluctuations in commodity prices, delays in the development of projects, capital and operating costs varying significantly from estimates and the other risks involved in the mineral exploration and development industry, and those risks set out in the Company's public documents filed on SEDAR. Although the Company believes that the assumptions and factors used in preparing the forward-looking information in this news release are reasonable, undue reliance should not be placed on such information, which only applies as of the date of this news release, and no assurance can be given that such events will occur in the disclosed time frames or at all. The Company disclaims any intention or obligation to update or revise any forward-looking information, whether as a result of new information, future events or otherwise, other than as required by law. About this company Probe Metals Inc.